The available options for our family of controllers increase in specificity as the needs and demands change with the end user. The process of choosing a controller for a gas delivery system must account for the species of gases, purge routines and the control engine model, in addition to a host of other stipulations, resulting in the customer receiving a tailored and practical product that meets their needs. The system software is highly configurable and supports the function of each controller architecture/formation. The product matrix (below) offers an overview of the general capabilities of our Gas Delivery System Controllers. *Hold Last State function is standard with the Siemens 1215C control engine. This function is optional on Allen Bradley Micro 800 control engine. CollabraTech Solutions’ controllers specified for use in valve manifold boxes (VMBs) are ubiquitous and adaptable to meet the needs of specific gas and chemical distribution applications. The controller product matrix (below) identifies options including stick counts and semiautomatic vs. automatic capabilities. The controller options also account for the choices between the Allen-Bradley Micro800 and Siemens 1215C control engines. 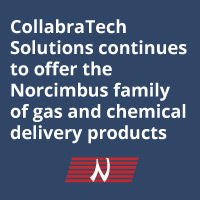 The engineers at CollabraTech Solutions will continue to offer specially made, custom controllers designed to the specifications of your gas delivery system, accounting for age and application, and interchangeable within brands and legacy products.